First, don’t follow the rules. 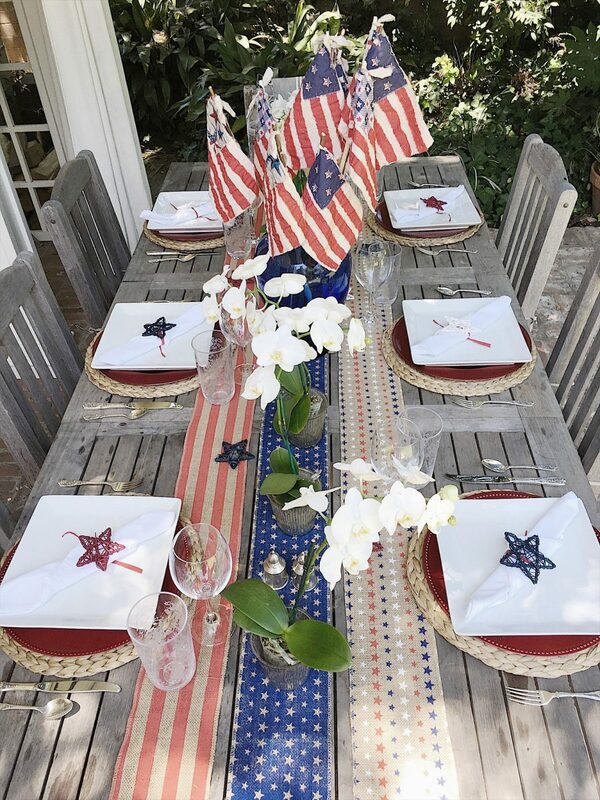 It’s ok to use fine china and silver outdoors. It’s also a great idea to mix up formal with casual. Be adventurous and have some fun. 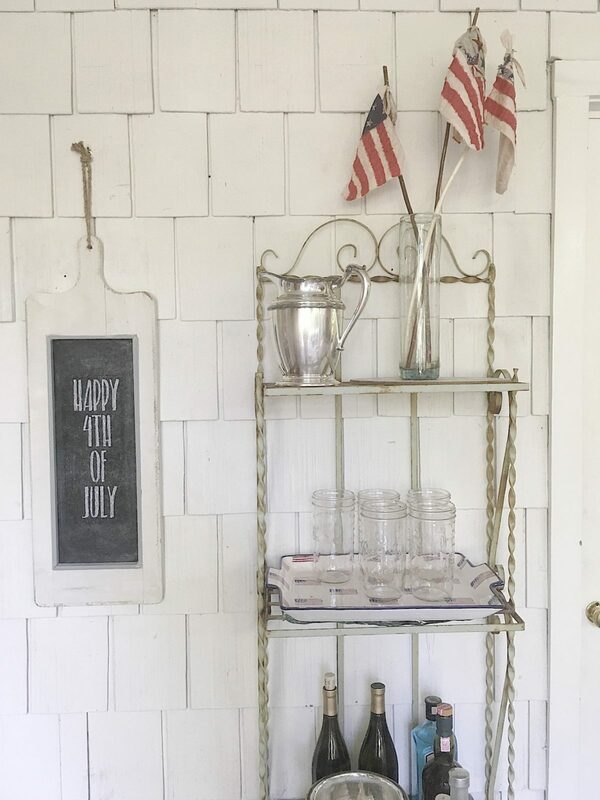 For example, take a look at my 4th of July table. I just put this together for the holiday! As you can see I mixed casual square white plates with a round charger. Then I added sterling silver flatware with plastic water glasses! I think the combination with all types of flatware and china makes for a much more interesting table. Have fun with the table covering. 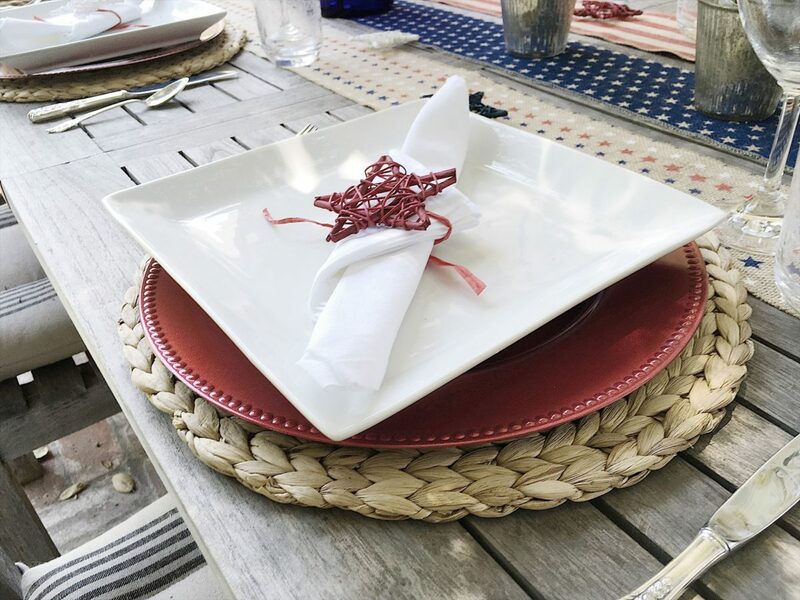 I found some very inexpensive burlap 4th-of-July themed runners (at Joann’s on sale for $5.00 each) and paired them with my sisal placemats from Ikea. 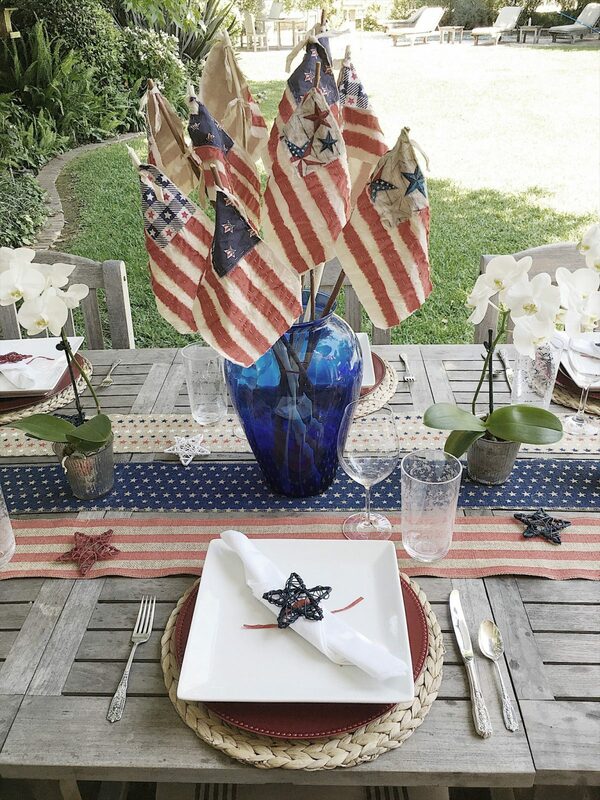 If you have an old quilt or piece of fabric, try that instead of a traditional tablecloth. Since dining outside isn’t as convenient or located as close to your kitchen, make sure you have everything you will need on the table. Put several water pitchers on the table to refill the glasses throughout the evening. Make sure you have salt and pepper shakers, extra ice and any condiments your guests might need nearby. You also might want to set up a bar with everything you will need for cocktails and wine refills at an adjacent table. I set up this bar on our outside porch. (It’s there full time!) It’s great during dinner, but it’s also fun for summer cocktails. Lastly, be prepared with light blankets or quilts if the temperature changes. You want your guests to be comfortable and stay around. If they get too cold, they might leave early! Lovely! Wishing for a screened porch here in NC-we have mosquitoes galore. Oh no! The west coast is lucky to have less bugs!